There are many ways to increase your business revenue here at Calendar Lady Promotions and our Wall Planners with Logo are an excellent promotional product. 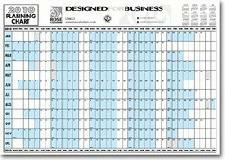 Our Wall Planners with Logo are wall Calendars with your business details and company logo printed along the top. then when you give them to your friends and staff and they hang it on their wall, they will also be displaying your personal advert. To find out more about our Wall Planners with Logo click here and fill in the contact form and we'll get straight back to you. Other promotional and personalised items besides our Wall Planners with Logo click here.